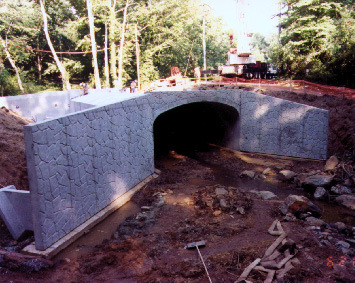 Contech replaced a 48-year old bridge in Marietta, Georgia, that was so weakened, it required weight restrictions. The Anderson-Benson Bridge, named for longtime residents, was dedicated by city officials with a ribbon-cutting ceremony. Seen crossing the Noses Creek in the photo above are a 1952 panel truck belonging to the local fire department, and a 2000 Chrysler PT Cruiser used by the police department. They represent the construction years of the old and new bridges. A $10,000 incentive was added to the contract with C.W. Matthews Contracting to encourage timely completion. The CON/SPAN® bridge opened 27 days early. Burnt Hickory Road enters Kennesaw Mountain National Battlefield Park just after the bridge crossing. City and park officials worked together to make the bridge blend with its surroundings. The concrete supports are textured to make them resemble stone and mortar. Guardrails are made of “weathering steel” for an oxidized “rustic” look.